TORONTO , April 9, 2019 /CNW/ - Purepoint Uranium Group Inc. (the "Company" or "Purepoint") (TSX:PTU.V) announced today that it has completed its initial 2019 fieldwork at the Hook Lake JV, a project owned jointly by Cameco Corp. (39.5%), Orano Canada Inc. (39.5%) and Purepoint Uranium Group Inc. (21%). The project lies on the southwestern edge of Saskatchewan's Athabasca Basin and is adjacent to and on trend with recent high-grade uranium discoveries including Fission Uranium's Triple R deposit and NexGen's Arrow deposit. "This winter drill program was crafted with four objectives in mind; to test the Spitfire deposit at depth, confirm the continuation of the Dragon zone to the north, identify geophysical targets between the Spitfire deposit and the Dragon zone and to initiate first pass drilling along the Derkson corridor" stated Chris Frostad , Purepoint's President & CEO. "As a result of 3D modeling interpretations of the Spitfire deposit, and an initial assessment of drill hole HK19-101 completed early in the program, the joint venture partners have requested a new comprehensive plan to test for deeply rooted mineralized lenses beneath Spitfire similar to the neighbouring Arrow deposit". 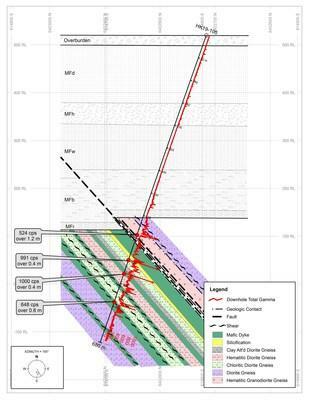 "We were also pleased with our work at the Dragon zone this winter, where (pending confirmation from assays) hole HK19-105 appears to have delivered one of the best uranium intercepts north of the Spitfire deposit (see cross section below)" said Scott Frostad , Vice President Exploration. "Unfortunately, warm weather has forced an early demobilization, delaying follow up drilling to the north". The second "W" conductor hole, HK19-105, was collared 800 metres northeast of HK19-104 and intersected numerous high-strain-zones, a post- Athabasca fault combined with strong hydrothermal alteration and elevated radioactivity (up to 1635 cps from the downhole gamma probe) in both the sandstone and basement rocks. The results of HK19-105 are considered to make the area surrounding HK19-105 highly prospective for both unconformity-type and basement-hosted uranium mineralization. Scott Frostad BSc , MASc, PGeo, Purepoint's Vice President, Exploration, is the Qualified Person responsible for technical content of this release.